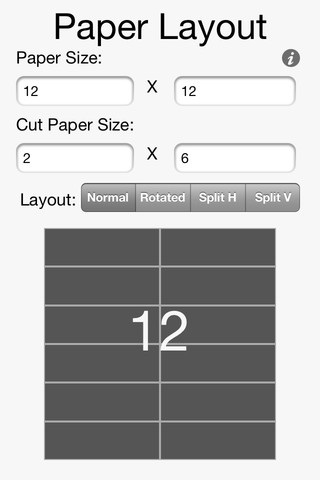 Paper Layout is a simple tool that calculates how many smaller pieces can be gotten out of a larger sheet. "I own a plastics company and we use PVC sheets that are 26" x 52". We cut thousands of sizes as we do a lot of custom work. These are thin sheets, .015 being most common, and we cut them on a Polar Cutter (paper cutter). So just testing this on one piece we do that we usually get 27 per sheet on, this program, showed me how we can get 28 per sheet by rotating the last row of pieces. That alone will save me approx $8500 a year. Just for that one piece! We do 2.5 million of this piece yearly. THANK YOU"
With 4 layout options you can find the most effective layout that will yield the most pieces out of your paper. Enter the dimensions of the sheet you will be cutting. Enter the size you want cut out. view the different layout options. Use the most effective one. Whether you are a professional who cuts large sheets, or a household scrapbooker this app will help you get the most out of your paper.